We’d love your help. 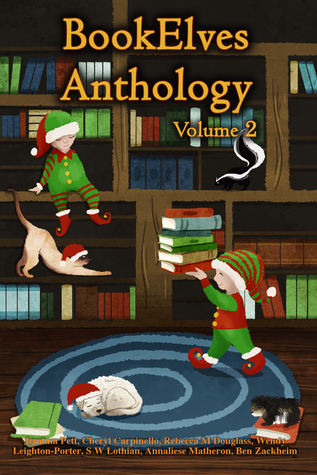 Let us know what’s wrong with this preview of BookElves Anthology Volume 2 by Jemima Pett. Seven authors, seven new tales to twang your heart as you snuggle up cosy and warm during the long winter nights. Will the Christmas fairy be ready to grant your wishes? Will Shirley Link solve all the clues to her presents? And will Santa's reindeer, a lost and forlorn hero, and a boy under the spell of a wicked witch find their way home when they are left out in the cold Seven authors, seven new tales to twang your heart as you snuggle up cosy and warm during the long winter nights. Will the Christmas fairy be ready to grant your wishes? Will Shirley Link solve all the clues to her presents? And will Santa's reindeer, a lost and forlorn hero, and a boy under the spell of a wicked witch find their way home when they are left out in the cold at midwinter? Find out in this second anthology from the MG BookElves, a selection that older children will love, and adults will enjoy reading to younger children. To ask other readers questions about BookElves Anthology Volume 2, please sign up. There's a little bit of everything here-- mystery, humor, fantasy, and adventure, each story a perfect length to enjoy with a hot cup of tea at the end of a busy day. Well-told with happy endings, these are my favorite kind of stories. Some of them made great read-alouds with the family. And I love that they were written from three different continents (North America, Europe, and Australia) -- each author's voice in this collection is unique. This is an excellent collection of festive tales, which are even better than those in volume one of the Book Elves anthologies. As one of the authors featured in this anthology, I can't exactly give an unbiased review...but I have to say, there are some terrific stories in here, even aside from my own! wonderful collection of stories perfect to be read near the Christmas tree. I left school with the careers advice "Well, you're going to do Maths at University aren't you?". And then what? Well, I tried a lot of things to find out what I should be doing. Eventually I retrained and found I loved working in environmental research, where I could write loads of interesting reports, articles and papers. And then I settled down a bit more, got my guinea pigs for company and found I left school with the careers advice "Well, you're going to do Maths at University aren't you?". And then what? And then I settled down a bit more, got my guinea pigs for company and found I had characters with stories that needed to be told. I started writing fiction at last. The Princelings of the East, first the trilogy, then a prequel, then another..., and now I'm writing a science fiction series for grown-ups, too, the Viridian System series. So this is probably my fifth career. The moral of the story is... follow your star, it's never too late, even if it doesn't quite happen as you expect.